Sunday’s should be officially announced as Home Lab Day, the statement stands true for most of the bloggers like me who spend their Sunday’s dedicating towards Home Lab and testing out various features and functionality available with different products. Dedicated this Sunday to test one of the feature available with Vembu Backup and Disaster Recovery, would recommend to check out previous articles talking about Vembu BDR Vembu BDR - Product Review and Top 5 reasons to choose Vembu BDR Suite which will give you quick insight about various features and functionalities available with Vembu BDR. Before we proceed further,would like to give a brief overview about my Home Lab which is running with 4 ESXi (2 In Production Site and the remaining two In DR Site), each of my ESXi host is running with ESXi 6.0.0 Build 2494585 with 8Gib and my vCenter Server is an appliance. VM Replication is one of the feature available with Vembu BDR and is crucial when it comes to Disaster Recovery Strategy, Vembu BDR helps us to achieve the same by taking a backup for Live Virtual machine and creating a replica image on your DR site thus maintaining the business continuity. 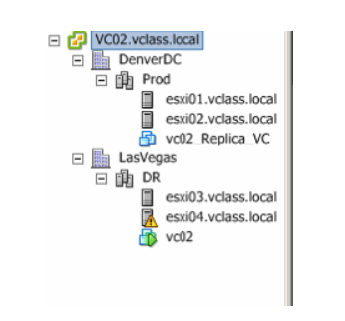 When it comes to configuring the VM replication with Vembu BDR, it’s pretty straightforward wherein we have to select VM Replication option and specify the Virtual machine being replicated. 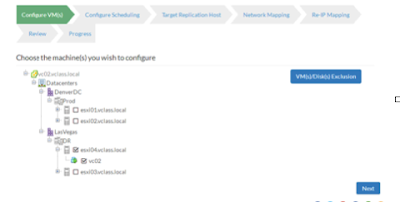 Once we have specified the Virtual Machine we are planning to replicate, we can go ahead and configure the scheduling option which allows us to choose when to run the replication Jobs. Next option in the list is the target replication host which has two options to choose the first option is Application Aware options which is an optional option to choose and requires guest os login credentials to proceed further, another option in the list is to select the destination ESXi host on which we are planning to replicate our Virtual Machine, we also have to specify the details of our destination datastore, with replica suffix name and the retention count, in my Home Lab environment my Virtual Machine was running in DR site on ESXi 04 so i replicated the same to PROD site on ESXi02 on the local datastore for ESXi02. Network Mapping and Re-IP Mapping options helps us to do the relevant Network Mapping and Re-Mapping which is useful when we are using different networks for our production and disaster recovery site, Wherein we can create number of Re-IP rules for various replication Jobs,I left this option as Blank because my Home Lab is local wherein both my Sites i.e Prod and DR are communicating to each other on the same network. 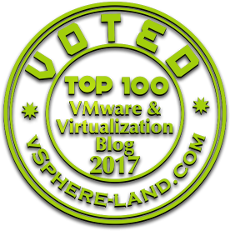 Review option helps us to specify the name of the Job and give us a quick summary about the the Configured Host/VM, Scheduling, and the destination ESXi host details. After proceeding with the replication we can monitor the progress of the Replication Job under progress bar, we can also login to vCenter Server and check out the various tasks and events happening with regards to Virtual Machine being replicated. Was able to see the virtual machine created successfully with restore points now available with it. Summary- Virtual Machine Replication is considered as one of the important approach when achieving the business continuity, and should be available as part of the bundle solution with disaster recovery solution allowing the administrator to quickly replicate their mission critical virtual machines to DR site or offsite.